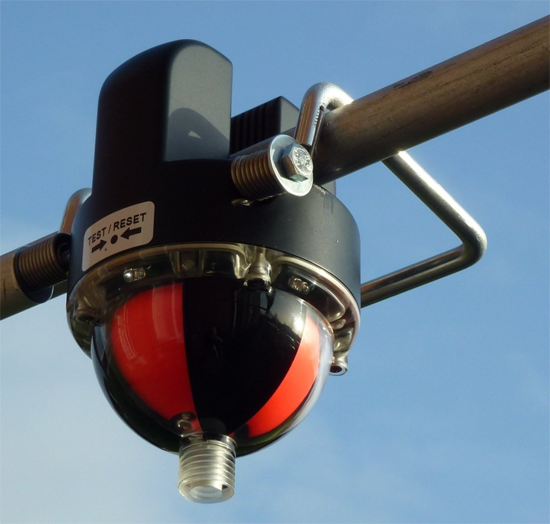 The Sensorform OFI-FLS is a Fault Passage Indicator for Overhead Lines, which is designed to assist in the rapid location and isolation of faults on Medium Voltage networks (1-38kV). When the current in the phase exceeds a preset level, the fault is indicated by means of both a mechanical flag indicator and high-intensity LED indicators. A high accuracy current sensor in the OFI, monitors the phase current flowing. When that current level exceeds a user-selectable threshold (as a result of a phase-to-phase or phase-to-ground fault) the fault is indicated by both a mechanical Flag Indicator, and 4 flashing, hi-power LED indicators. The path of the fault current from the feeding point to the fault location is marked by the triggered OFI’s. The fault is located between the last OFI that has been triggered and the first OFI which is still inactive. The unit resets either automatically when power to the line is restored, after a user-selectable timer period, or manually via a hot-stick mounted magnet. Detection and indication of faults in overhead cables. Right click & select “save target as” to download.